We’re fostering three cats all of a sudden, and it’s been a while (seven or eight years, probably) since we’ve had young, jumping cats. Which means we have to (as we’ve been reminded) jumping-cat-proof our house. Which is just the opposite of child-proofing your house. Wherein you take dangerous and breakable things from low places and put them in high places. Instead, we have to take the knick-knacks and bric-a-brac that we’ve come to display atop our bookshelves (which are the main type of furniture we own) and shove them back to the wall so that a cat won’t try to pass behind them. Also, I might have to move my row of paperbacks from the top of the to-read shelves in my office that seem to be falling like snowflakes every night. On the plus side, gentle reader, you might be in line for another decade’s worth of cat pictures if our past fostering habits prove prologue. Jeez, people, do I have to think of everything? And all your tricks ain’t bringin’ you bowls of it. I sincerely hope you got that stuck in your head, gentle reader, because my children will need more people to fill out a support group. Dustbury linked to another one of those technology articles written in the hip, modern style that indicates an arch with-it fellow shaking his head at the backwardness of others. In the rural areas of the country, which is most of the country but very little of the country where technology writers live, you have two choices, and it’s not fiber or copper or DSL or cable. You get to choose between dial-up, which is slow but inexpensive, and satellite, which is more expensive, slightly faster, and sometimes spotty. So, yes, many people still use it. Because it makes sense, and it probably suits their needs. Yes, I know, cellular offers a more technically challenging and sometime viable solution, but it’s not available in all areas either. Have you ever seen the little marker on your smart phone that says data is unavailable in an area? I have. The author himself mentions multi-part forms, and that’s a no-brainer for me. The author must not have worked in an environment where this makes sense. It might make some fiscal sense for me to give up our residential landline phone, but the telephone works when the power goes out, brothers and sisters. In the event of a disaster, it might be your link to the world when your Internet and your cell phone chargers are unavailable. I’ll cling to it until such time as the phone company takes it away from me. The author talks about the cloud and downloading music, but I’ve had enough hard drive failures and have seen enough services shuttered that I wouldn’t trust the Internet with my data anyhow. Besides, you can rip them to bits if you must, and you’ll find them very cheap at garage sales. So instead of ‘renting’ a movie for $2.99 or downloading a whole song for a buck, you can find whole albums for a quarter and movies you can watch over and over for a buck. Confession: I just removed our last television with a picture tube. Not because it was not working, but because we dropped a dish box and now it was more important to hook in a DVD player and VCR (to play obsolete VHS tapes!). Also, I had an extra television I’d used as a computer monitor for a while. Otherwise, I would still have it. You know why? It still worked. If you hit any number of yard sales or thrift stores, you’ll find any number of old console televisions from the 1960s, complete with picture tubes, flickering some broadcast television. And you know what? They still work. Compare that to the longevity of other types of televisions. No contest, hey? Oh, I could go on, but it frankly boils down to this: The ‘obsolete’ things still work. Vinyl records, cassettes, televisions, fax machines, the whole lot of them still fulfill a function and still work, so yes, people will still use them. It’s easy to have the disposable attitude, I reckon, if you’re young and have not accumulated a number of things that work (which might never happen to today’s young, I reckon. Wait, instead of repeating ‘I reckon,’ I mean ‘by crackey.’). Or if you’re someone who trades in a phone every two years or a car every three. It’s a new mindset, one that most people outside the tech industry don’t share. This tome is one of the 1000+ page books I’ve been going on about reading for the last year or so. It actually took me over a year–something like a year and three months–to read this book. Short stories will do that–offer you the ability to stop after only five or ten pages in a night, where a longer work with longer chapters will at the very worst compel you to read maybe a dozen, and then maybe another chapter. Then there is “The Dream-Quest of Unknown Kadath”. I’m not a fan of the Dreamlands portion of Lovecraft; I know he sometimes liked to dabble in the very fantastic, but part of the grounding in his stories is that the bizarre and dangerous happens to people in the real world. When we get into the Dreamlands stuff, where Randolph Carter goes through a series of adventures in his dreams, where the weird does not have the grounding in every day life or reality, I sort of lose caring. So when it came time to read “The Dream-Quest of Unknown Kadath”–which I had never read before–I had to slog. For weeks or months. At any rate, if you’re a fan of Lovecraft, this book will please you (your Dreamlands mileage may vary). It includes all the fiction, including the longer pieces such as “At the Mountains of Madness” and whatnot. In college, I read a number of shorter paperbacks of Lovecraft’s work, each based on one of the cornerstone stories (“The Lurker on the Threshold and Other Stories”, “The Colour Out Of Space and Other Stories”, and so on). So many of the pieces were familiar to me, but many of the shorter, lesser stores either I had not remembered or had not read. 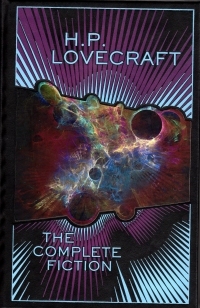 So all in all, it’s a great collection if you’re in the mood for Lovecraft. And sometimes I really, really was, and sometimes I was not. His archaic style sets a certain gaslight feel to the stories that you cannot get elsewhere, and the language will teach you many neat words. In my twenties, I learned the words “foetor” and “eldritch” from Lovecraft, and I started keeping a list of words I wanted to drop into conversation. However, I misplaced that notebook eight months ago, so I don’t know what words I wanted to learn, and I didn’t learn them very well before that. Ah, well. In addition to his fiction, the book includes some short stories he wrote as a kid and draft portions of “The Shadow over Innsmouth” and Lovecraft’s nonfiction essay “The Supernatural in Literature” which explores the history of what he calls the “weird” in literature up until his present day (the 1930s). He name-checks a lot of authors throughout history and identifies works he likes. It’s a fifty page treatise, and it at turns made me want to read some historical Gothic fiction and bored me. He lavishes praise on Algernon Blackwood, though, and the complete tales of Blackwood is one of the few books I’ve actually put down with the intention of not picking back up, so I will probably avoid the authors he mentions except Lord Dunsay and maybe Machen. Or not. This is less of a book report than marking my achievement. Sorry. Tree-climbing is emerging as a recreational sport, similar to rock climbing. Local instructor Guy Mott says tree-climbing builds muscles and can lead to improved fitness and weight loss. Not only is it reliving, albeit in a limited fashion, one of the joys of childhood, but it’s experiencing it in a way that we did not as children but that we’ve forced onto them. Namely, it’s highly ritualized, highly supervised, taught in the right fashion, and with a bunch of safety equipment. It’s regression for the scaredy-cat set. Juxtaposed, another headline in the St. Louis Post-Dispatch today: Worker for tree removal company dies on the job. Well, the more people in trees, the fewer people hogging the pec fly machine at the gym, so to each his own when it’s not the pec fly machine at the gym, I guess. Well, I obviously don’t have a schultüte now. Well, I guess it’s not obvious to those of you on the Internet who are not actively rifling through my boxes of personal mementos. Since about the beginning of the 19th century, German school kids get a Schultüte on the first day of first grade. It’s a big cone made out of heavy paper, decorations on the outside and tied shut at the top with a bow. The Schultüte is filled with candy and small items useful for school (like colored pencils or erasers). They’re usually purchased commercially, but some families make them from scratch. The Schultüte is an extremely common thing in Germany, but I don’t think any other culture has the same custom. Well, mine wasn’t a real schultüte, because I wasn’t in Germany and I wasn’t going into first grade. But when I started (half-day) kindergarten at Douglas Road Elementary School way back in the day, Mrs. Noisworth had prepared a smaller rendition of that thing for us. I remember the paper cone filled with candy, trinkets, and a penny wrapped in aluminum foil. I hadn’t remembered that for a long time until Marko triggered the memory. Good to know it’s still in there. The manufacturer recommends this product for fifteen-year-olds and up. Do you see a normal fifteen-year-old riding on one of these? What is Herb Alpert’s favorite glass? This advertisement is from 1993, and, forgive me, I associate Herb Alpert with the 1960s and maybe the 1970s because of his prevalence on LPs. Most of my Herb Alpert LPs are from the early years (The Lonely Bull, Going Places, What Now My Love, S.R.O., Sounds Like, and Warm means I own most of his 1960s catalog and nothing after), so you can understand why I am sometimes taken aback when I realize he has continued releasing albums even to this day. Which is why in 1993, he would still be a relevant pitchman, although I would have expected to see him selling Reddi-Wip. 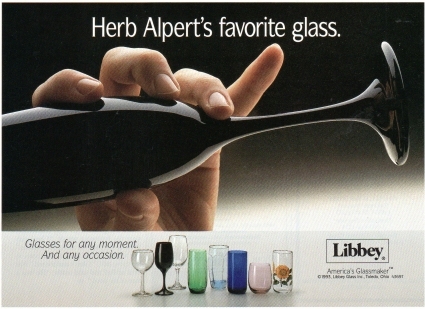 Libbey, his favorite glass, is also still still in business, although its magazine advertising campaigns seem to have fallen off. I did not come to this book with an open mind. As many of you might recall (and given the readership of this blog in its 10th year, I mean ‘Gimlet and Charles’), I was a big fan of the Weber and Dolan radio program back in the olden days. I used to listen to them, first when I worked in the testing lab at Data Research Associates and shared a dark closet with a gruff fellow who was not much for conversation–as if I am one for conversation. Then I listened to them whenever technology and legality allowed them to stream it on the Internet and I had an operating system that allowed it. How much of a fan was I? I asked my brother to go get me some of their autographed coffee mugs from the station back when he lived in Milwaukee and I did not, and he did it. As you can see, I still have them proudly displayed in my office. So I’m a homer as far as the author goes. I forget where I saw that he had a book, but when I saw that, I had to have it. At any rate, the book. As you might guess, Bob Dolan’s brother Tim has become the Cardinal of New York, the head of the American church. Bob tells stories about growing up with Tim and their relationship to shed insight into his brother’s character and into life itself. Some of the conversations are a little too exact, which means either they were recreated or, more likely, that Bob recorded them when he thought about writing the book. Some of them do have an interview flavor after all. I really enjoyed the book. Bob pokes fun at himself, and much of the book is as much about Bob and his travels with his brother as his brother ascends the Church heirarchy. There are a bunch of Catholic themes in the book and some good Christian messaging, but it’s not overwhelming or proselytizing. Mostly, it’s musing, remembering, and humanizing a powerful figure in a way only a brother can. 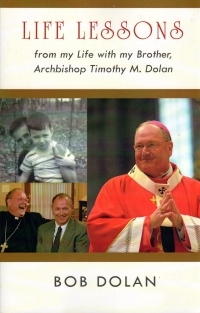 However, the book is more about Bob learning about himself and life with his brother’s occasional counsel as it is a bio of Timothy Dolan. Which is what I related to anyway. You want to know what kind of man Bob Dolan is? When his brother was in Rome for something or another and Bob’s family was there to celebrate it, Tim gets a couple passes to meet the Pope, wherein he goes up to the Pope at the head of the church and the people with him get to speak to the Pope and maybe get a blessing. Tim offers one of the passes to Bob, and Bob lets his wife go instead. There’s as much for us to learn about life and love from Bob Dolan as his older brother, maybe. There are two tours a month, it looks like. One of these days, I shall make a pilgrimage. Listen, if you say a dog with rabies is rabid (and you pronounce the A sound differently in each for some strange reason)…. I can dang well say that a woman with babies is babid. So we visited a church garage sale at St. Elizabeth Ann Seton church in Springfield on Saturday. It was bag day, and that’s like catnip to me. I rub my cheeks and roll on the junk you can buy, especially late in the day on bag day. No, this isn’t a Good Book Hunting post, as I only bought three books (X-Men, the novelization of the film; A Room of One’s Own by Virginia Woolf; An American Plague: The True and Terrifying Story of the Yellow Fever Epidemic of 1793 by Jim Murphy; and The Worldly Philosophers by Robert L. Heilbroner)–and who wants to see a photograph of just four books? Instead, I bought a bunch of things for craft work to add to the backlog of other craft things accumulating since I’ve moved away from doing anything at my workbench but have yet to alter my acquisition of things to do at my workbench. I also bought a stack of videocassettes to join the hundreds of other films that I’ve not watched since buying them at garage sales and book fairs. But that’s neither here nor there. I did make one purchase that sounds like it could be the plot of a cheap slasher film. I expected either heavy metal or some heavy gospel of some sort (given I bought it at a church garage sale. Well, then I hoped it was not gospel of a dark and disturbing sort. Given the font on the cover, I was just going to trust iTunes’s music database to fill that all in, so I popped it in to import, and iTunes could not find it on the Internet. You see how this could be the beginning of a cheap horror franchise of which I would be only a small part? 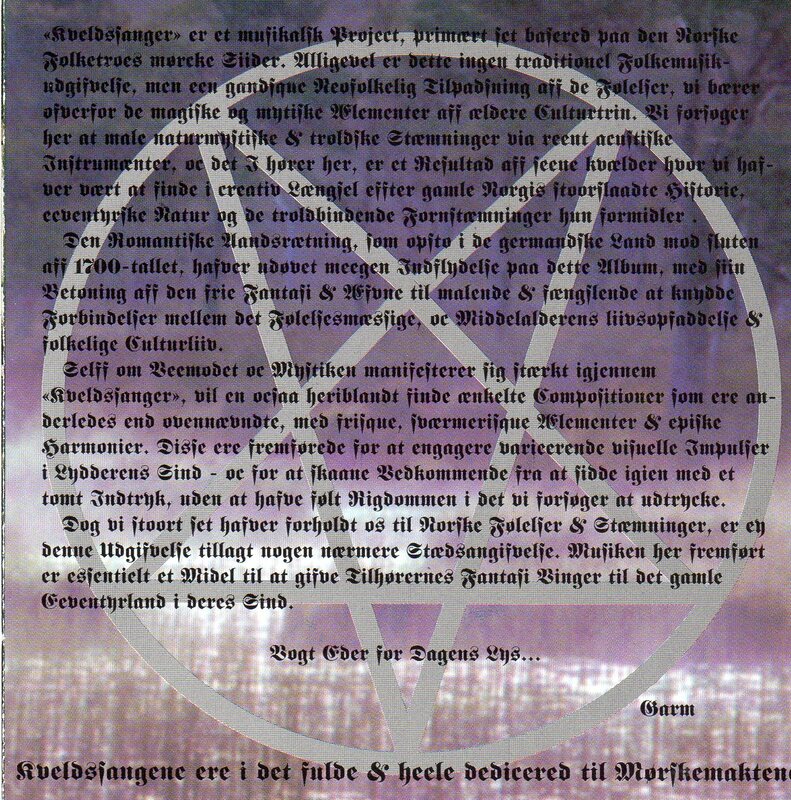 A Daemonic CD from a twisted Catholic church that unleashes unearthly forces when played or on the Internet when imported into iTunes? 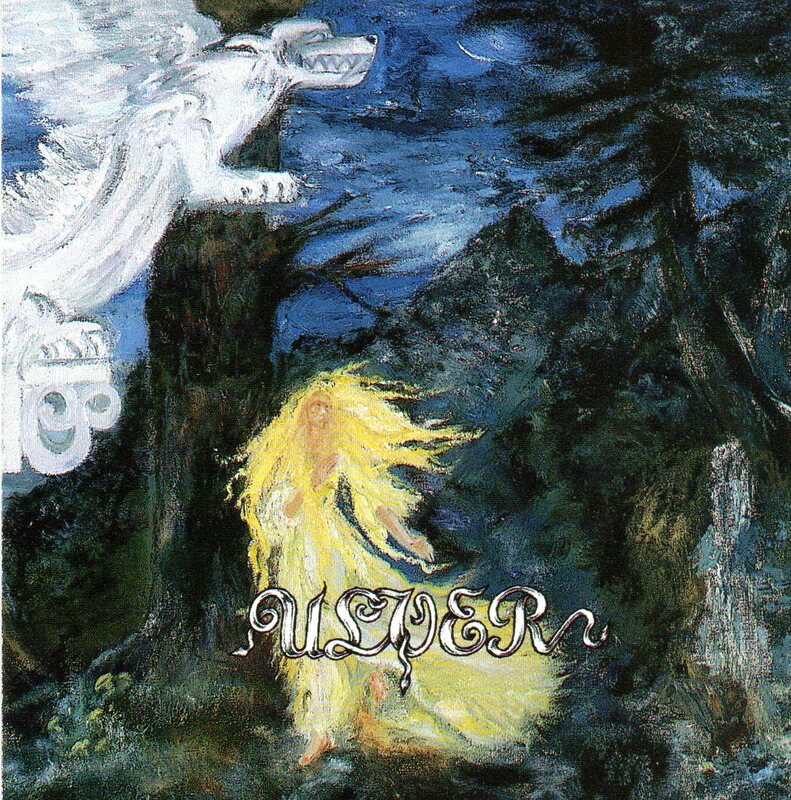 So I looked more closely and did an Internet search, and the album is Kveldssanger by Ulver, a Norwegian black metal band who changed it up with this, their second album. It sounds folky and, instead of metal screaming vocals, some neo-chanting. Which really doesn’t detract from the whole strange dark CD invokes dark forces motif. Note that I bought this CD on the week where I posted this. Life has a way of connecting dots for us. Well, all right, our minds do, or at least mine tends to move in strange directions that seem to be patternic. And, if you’re wondering, it’s the first of the two CDs I bought this weekend. The second? The Best of Barry White. Which goes to again prove I am eclectic. This book is a stunning departure from the series, wherein Mack Bolan…. Aw, who am I kidding? 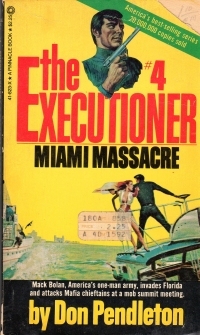 Mack Bolan hits a hard site in Phoenix and follows its bosses to a big deal meet-up in Miami, where the mafia heads are getting together to finally take drastic steps to eliminate The Executioner. He liberates a couple women who were under the thumb of the mob and shoots a lot of bad guys and perpetrates an audacious assault on a couple of hard sites. In other words, it’s a lot like the other books in the series. What’s most interesting in these books is the evolution of the mythology and the beginning of the plot points that get resolved later. In this book, the Talifero brothers are introduced; they’ll hound him off and on for a couple of books. The book also has a side plot where Bolan helps and is helped by Cuban counterrevolutionary guerrillas. How quaint. In 1970, perhaps that seemed like a possibility. In 2013, that’s a very dated relic. At any rate, I pick these books up as filler or breaks from longer reading. I’m getting a little down on them, especially when it comes time to say something intelligent about them on the Internet, so maybe I ought to read something else for a while. I bought this book at a local used book store (Redeemed Music and Books, if you must know) on one of my local history sprees. The author is an attorney, the progeny of a pretty successful businessman in the first part of the twentieth century, and it covers the attorney’s formative years in school, college, and the military during World War II. The first chapters jump around a bit, and I thought it reminiscient of Over the Hill and Past Our Place (also by a successful man looking back on his life from almost the same time period). The recollections in the beginning are rather pasted together willy-nilly, but the book improves as it goes along and as the boy reaches an age where he can remember the stories better. As I said, he was the son of a successful businessman, so his experiences in the depression years are mostly recognizing that the depression is going on. The lad goes to the University of Missouri and then goes on to become a lawyer before joining the military in World War II. It’s not high history; it’s more of a vanity project where the fellow put his story down for his family. But the glimpses of the cities around Springfield in that era and the college experience make it very interesting in spots. So it’s worth it if you’re looking for that sort of flavor amid a whole lot of name-checking people who mattered eighty or ninety years ago. The book has a date range on it, 1915-1945. The author has another book about his time as an Ozarks lawyer after World War II, and I’ll keep an eye out for it. Michael Brown’s long hours of studying the exotic language of Finnish may seem like a pretty noble use of time. An American international-relations major at the University of Washington in Seattle, he aims for a life in foreign service. Finland’s strategic role in the Arctic and as a vocal member of the euro zone means his investment in the language could be a good bet. But, Mr. Brown’s interest has a much more casual origin. Mr. Brown isn’t the only one to channel a love for the metal genre into the pursuit of learning an obscure tongue. A band of young metal heads—spanning Romania to Singapore—have taken up a Northern European language in order to better appreciate or even mimic their favorite metal bands.